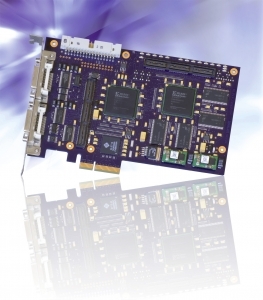 A new family of FPGA-based GigE frame grabbers is now available from Stemmer Imaging. The Silicon Software microEnable IV AQ4-GE and VQ4-GE can accommodate up to 4 GigE cameras simultaneously. The on-board FPGA provides real-time image processing significantly reducing the load on the host CPU. Both frame grabbers are also available in PoE (Power Over Ethernet) versions. The microEnable IV AQ4-GE is a simple to use acquisition board that, through standard AcquisitionApplets, provides simple FPGA processing functions. This allows processes such as flat field corrections and high quality colour reconstructions from raw Bayer data to be carried out at high speed without any complex set-up.